When I’m looking at recipes, certain ones always stand out. Sometimes the whole premise of the recipe seems interesting. Some use an exotic ingredient. I always like those that involve using a part that’s discarded (frequently shells) to make a stock. Certain ingredients just look like they belong together even though I’ve never had them that way. But some recipes appeal not for their sophistication but for their simplicity. A few accenting flavors allow enhance the main ingredient instead of fighting for attention with it. The sum of the ingredients is much more than their value separately. These are the recipes and, in most cases, the flavors that appeal to me: simple pasta sauce, uncomplicated roast chicken, a simple steak cooked well. I don’t want my lamb to taste like beef or my pork to taste like chicken. I want lamb that tastes more like lamb and pork that tastes more like pork. When I first saw this recipe, I made a mental bookmark about it. I hadn’t thought about it in awhile, in part because I had run out of chicken stock and hadn’t, until recently, had any time to make more. Now that I had the ingredients I needed as well as a cool day to fit the recipe. The recipe is simple. There’s no need to even brown the chicken. It just simmers for an hour. Nothing more to it. While I have no evidence that it wouldn’t work well with non-fresh ingredients, I wouldn’t risk it. With such simple flavors, they need to be at their best. The chicken was moist and flavorful. But what was best was the sauce. Dipping bread into it was close to divine. Trim any excess fat from the chicken, dry on paper towels, and season with salt. Place the onions and the olive oil in a large dutch oven along with several pinches of salt. Place over medium heat and cook until the onions are transparent and soft, about 5 minutes. Add the bay leaf, thyme, and chili, breaking up the chili. Add the vermouth and bring to the boil for 1 minute. Add the tomatoes, saffron, garlic, and chicken stock and bring to a simmer. 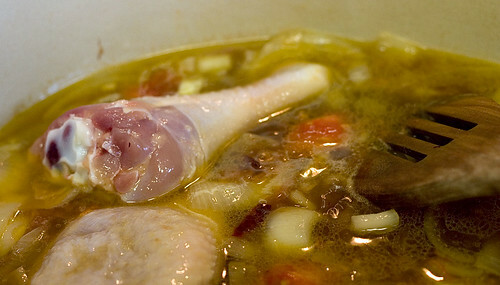 Add the chicken legs and thighs and return to a simmer. Slowly simmer for 30 minutes, uncovered, turning the meat once. Turn the chicken legs and thighs and add the chicken breasts. Slowly simmer for 30 minutes, uncovered, turning the meat once. Check the sauce for seasoning. Remove the chicken and boil down the sauce if needed. 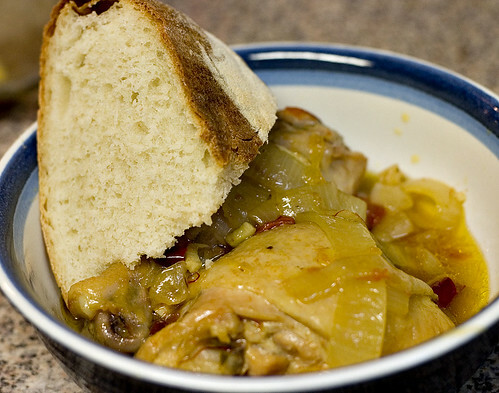 Serve the chicken with the sauce and fresh bread.